Tiling the plane with a single pattern is a mathematical problem that has interested humans since Antiquity, notably for the aesthetic quality of tiles in mosaics or tiling. One of the unresolved problems in this field that has been puzzling the scientific community since 1918 has now been definitively resolved thanks to Michaël Rao of the Laboratoire d'informatique du parallélisme (CNRS/Inria/ENS de Lyon/Université Claude Bernard Lyon 1). Using computing tools he was able to demonstrate that there are only 15 five-sided patterns that can tile the plane. The research is now available on the Arxiv website. There are a number of solutions for covering a floor with a single form, such as triangles, squares, rectangles, hexagons, etc. The exhaustive search for all of the convex forms that can tile the plane—a form with angles smaller than 180° that can cover an entire wall without overlapping—was initiated by Karl Reinhardt during his thesis in 1918. He showed that all triangles and quadrilaterals can tile the plane, but that there were only 3 types of hexagons that could do so, and that a polygon with seven sides or more could not do so. Only the question of pentagons remained open. 15 types of pentagons were discovered from 1918 to 2015 as part of singular research: initiated by Reinhardt in 1918, it went through a number of twists and turns, such as new discoveries by amateur mathematicians, up to the mediatized announcement in 2015 of a new 15th form 30 years after the 14th. Yet the scientific community was still unable to determine whether there were other forms of pentagons that could tile the plane. Michaël Rao, a CNRS researcher at the Laboratoire d'informatique du parallélisme (CNRS/Inria/ENS Lyon/Université Claude Bernard Lyon 1), has now definitively shown that there is only a finite series of families of pentagons to be taken into account. Rao used a software program to generate all of the possibilities, and showed that 371 families of pentagons could potentially tile the plane. He then tested each of these families using another program, and demonstrated that only 19 types of pentagons met the conditions for angles and side lengths required to tile the plane. Among these 19 types, 15 corresponded to already known types, and the four others proved to be particular cases of these 15 types. Consequently, only 15 types of tiles can tile the plane. Rao was able to settle a century-old problem with his methodology, and to open new perspectives. All of these convex tiles can tile the plane periodically (that is, the tiles repeat infinitely). Yet it is not yet known whether there is a tile that allows for non-periodic tiling. 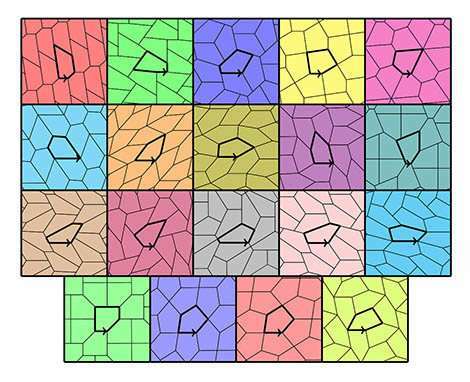 Fortunately most of these techniques can also be used for non-convex polygons, and could thus serve as a basis for resolving another problem in the field of tiling, better known as the "Einstein Problem" (from the German "ein stein").